The 2019 Jeep Compass is a popular and rangy crossover SUV. 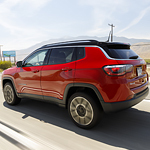 Like many vehicles in the Jeep family, the 2019 Jeep Compass includes many built-in safety features in its design system. Features like rugged suspensions, tough bumpers, and soft side impact zones are well represented on this vehicle. That said, it also employs several other lower key features that do just as much to protect driver and occupant safety. These features include special security headlights as well as a variety of rear sensor systems. The 2019 Jeep Compass works to protect drivers and occupants as they enter or exit the vehicle with its special delay off headlight system. This system keeps the bright LED headlight and brake light system on for a prescribed number of seconds before and after occupants leave the vehicle. On dark nights in lonely locations, this lighting system can provide an extra layer of illumination and safety. The 2019 Jeep Compass also works hard to protect occupants from dangers that lie to the rear. To mitigate blind spots and also to increase driver awareness, the 2019 Jeep Compass includes a proprietary Park View rear parking camera in its technology package. This camera sends a high-resolution view of the rear of the vehicle to the built-in driver display screen. Combined with specialized rear window wiper and rear parking sensors, this system can help drivers to avoid hitting people or other objects.